The Intergovernmental Panel on Climate Change (IPCC) Fifth Assessment Report (AR5) brings policymakers and the public up to date on the state of climate science. The IPCC report, released in stages, is the most comprehensive assessment of existing climate change research and provides a baseline for understanding and action. The Working Group II report, released Mar. 31, 2014, provides strong evidence for the global reach of the impacts of climate change. The report demonstrates that impacts are occurring now, that many natural and human systems are vulnerable, and that further warming will make the consequences of climate impacts even worse. Although steps are being taken to adapt and build resilience to current and future climate stresses, the report argues that in many regions of the world, our planning has been far short of what’s needed. Overall, the costs from the impacts of climate change are expected to outweigh the benefits: As much as 2 percent of global income could be lost as a result of warming up to 2.5 degrees Celsius. It is difficult to estimate costs for warming beyond 2.5 degrees Celsius, but it is anticipated that many impacts become worse with more warming. Poor, marginalized, and rural communities are likely to be hit hardest by climate impacts. For these vulnerable groups, climate change acts as a “risk multiplier” worsening existing social, economic, political, and environmental stresses. There is no “one size fits all” solution for adaptation – approaches will need to be tailored to the stresses, vulnerabilities, and resources that exist at the local and regional level. Mitigation action taken now can significantly reduce the risks that we face at the end of the 21st century. The body of literature upon which the report draws more than doubled between 2005 and 2010, demonstrating the growth in research focused on impacts, vulnerability, and adaptation. In the following sections, we describe some of the key risks identified in the report, and focus on some of the material related to Health, Food Security, and Ecosystems. In addition, we discuss the report’s overarching perspective on managing risk in the face of uncertainty, and the assessment of current and potential adaptation efforts. Threats to communities in low-lying coastal zones from sea level rise, flooding, and storm surge. Food insecurity of poor populations, which can be aggravated by extreme weather events and longer-term trends in temperature and precipitation. Shortages of freshwater for drinking or agriculture, especially for rural populations. Loss of ecosystems on land or in the ocean, especially those that provide valuable services (e.g., forestry, fisheries). Damage to infrastructure from extreme weather events. Many species that live on the land and in the water have already shifted their ranges and have seen their populations shrink in response to global warming. Future extinction risks are increased under all emission scenarios. In the distant past, natural climate changes at rates much slower than those occurring now led to significant plant and animal extinctions. Under higher emission scenarios, there is a high risk of abrupt and irreversible change in the structure and function of many freshwater ecosystems, including the Arctic boreal-tundra system and the Amazon rainforest. Some regions, especially those at high latitudes, have been and are likely to experience increases in crop yields. However, losses in other parts of the world are likely to offset these gains (see Figure 1). For the world as a whole, climate change is anticipated to reduce crop yields for the remainder of the century, even with adaptation. This conclusion is a departure from the previous AR4 WG II report, in which crop production increases in mid-latitudes could offset losses in the early part of the 21st century. Shocks to global food prices since 2007 may have been related, in part, to extreme weather events. Given future projections for some types of extreme weather to occur more frequently or with greater intensity, as well as projections for lower crop yields, food security in many regions may be compromised. Major changes are also projected for fisheries, with a geographical redistribution of important species. Risks are highest in the tropics and in the Arctic. Figure 1. 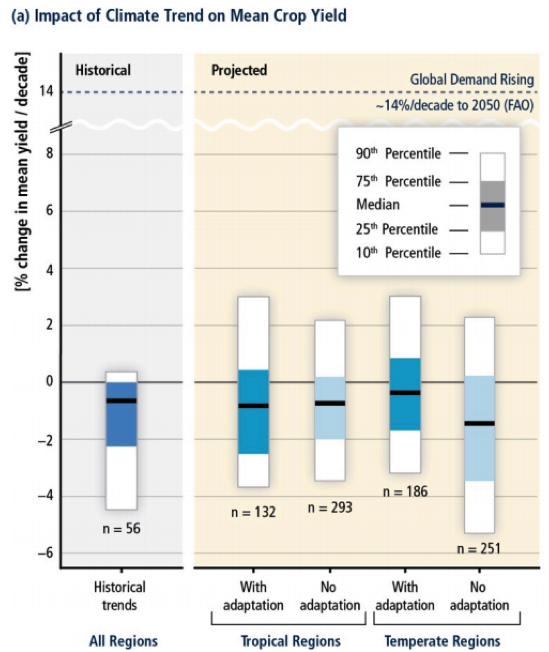 Figure 7-7 from the IPCC WG II report. Based on observed and projected impacts to crops, mean yields are expected to decline (i.e., all the median estimates (dark horizontal lines) and most of the interquartile ranges (blue columns) all fall below zero. Although adaptation could mitigate some of the impacts, the changes are still likely to be negative. Demand for crops is projected to increase by 14 percent per decade through 2050 (dotted line at top of graph), which could exacerbate the consequences of declining productivity. Climate change is expected to exacerbate existing public health challenges. A particular issue is heat waves. The report notes that climate change has raised the risk of extreme heat, and that a number of heat events around the world led to widespread heat-related illnesses or deaths. Future warming is expected to make these impacts worse, and they harm from more frequent and intense heat waves will likely outpace declines in cold-related mortality. Greater flood risks in some areas can pose a direct threat to lives, in addition to disrupting water treatment. Projected changes in climate that reduce agricultural productivity or the availability and quality of water can harm human health. Changes in the incidence and geographic range of vector and water borne diseases can introduce new risks to human health, especially along the edges of these diseases’ current range. Decision-makers must contend with the potential for significant warming that would increase the risk of “severe, pervasive, and challenging impacts.” Some of these impacts include the crossing of tipping points where changes become irreversible. Yet our knowledge of changes in the climate system, the vulnerability of natural and human systems to these changes, and the effectiveness of potential responses are all subject to some level of uncertainty. To address this challenge, the AR5 WGII report highlights iterative risk management as a useful tool for making decisions related to climate change. This means treating adaptation as more than a set of one-time decisions, but as a longer-term process of assessing and reassessing risks, monitoring the effectiveness of past decisions, and applying lessons learned to plan for the future. 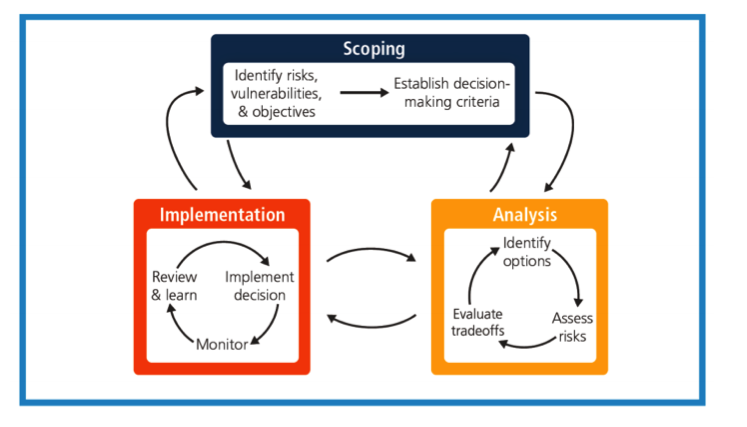 See Figure 2 for an illustration of iterative risk management, which can be applied to decisions, including those associated with adaptation,- in which information about risks and benefits is constantly evolving. Figure 2. Figure SPM.3 from the IPCC WG II report. A schematic that illustrates the feedbacks of information in an iterative risk management approach for adaptation. AR5 includes a more extensive discussion of current and potential future adaptation. The report notes that adaptation planning is already occurring in many regions and becoming part of existing planning processes. The most effective approaches are considered to be those that take into account the local and regional factors that affect current and future vulnerability. These are often based on non-climate factors, such as political instability, patterns of settlement, or distribution of age or wealth within a population. Engineered adaptation options have been the most common response to climate change, but ecosystem-based options are also emerging. National governments play an important role in adaptation through the development of adaptation plans and policies, coordination of sub-national or local groups, and provision of technical and financial resources. However, the report identifies roles for a wide range of actors in adaptation planning, including individuals, businesses, and local governments.